Category Archives for "Thanksgiving Printables"
Here’s a friendly turkey who wants to help your kids be thankful. 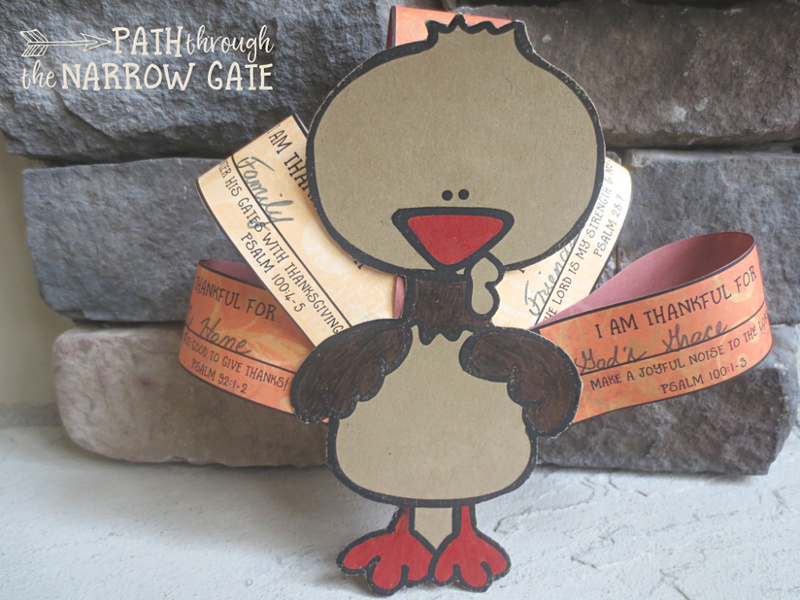 This adorable Thankful Turkey craft is easy to make and fun to play with. Best part? He reminds us how much we have to be thankful to God for! Are you looking for a great craft idea to encourage your kids to be thankful? 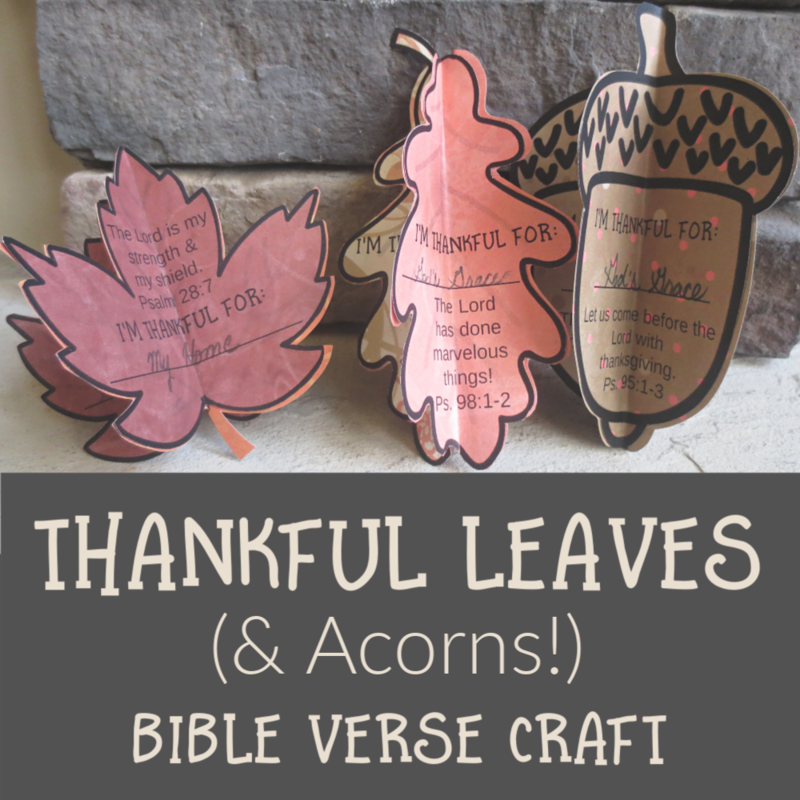 Try this Thankful Leaves Bible Verse Craft. Not only are these thankful leaves super easy to make, they also turn out really cute. You may choose to print the leaves onto pretty paper (like I did in the photos) or print the leaves onto white paper and have your kids color their own. Thanksgiving is just around the corner! Are you looking for a super-fun way to encourage your kids to be thankful? Here’s an idea: A Printable Thanksgiving Finger Puzzle. Thanksgiving is so much more than a day to eat turkey. 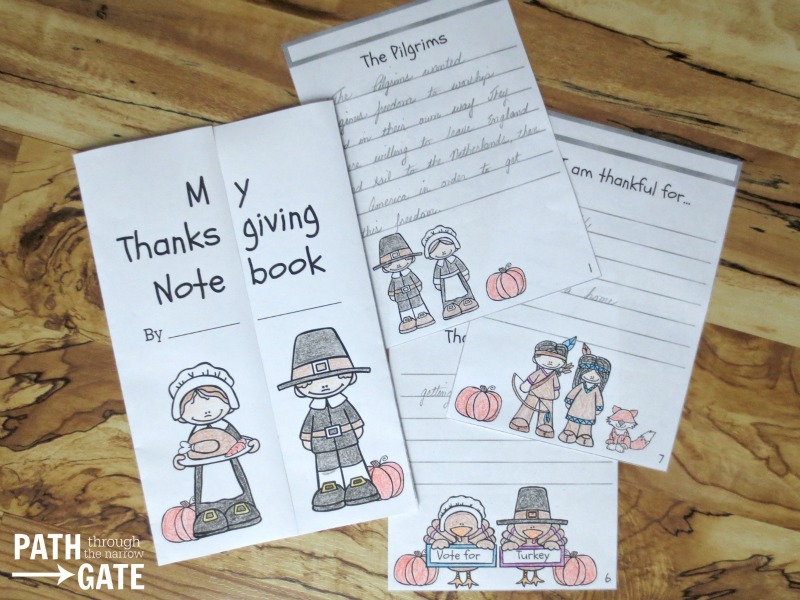 Encourage your kids to think about the history of Thanksgiving and their own blessings with this Thanksgiving notebook. This fun notebook is perfect for working on during the long drive to Grandma’s house, keeping kids quietly entertained while the turkey is still in the oven, using in a Sunday School classroom, or handing out at a class party. 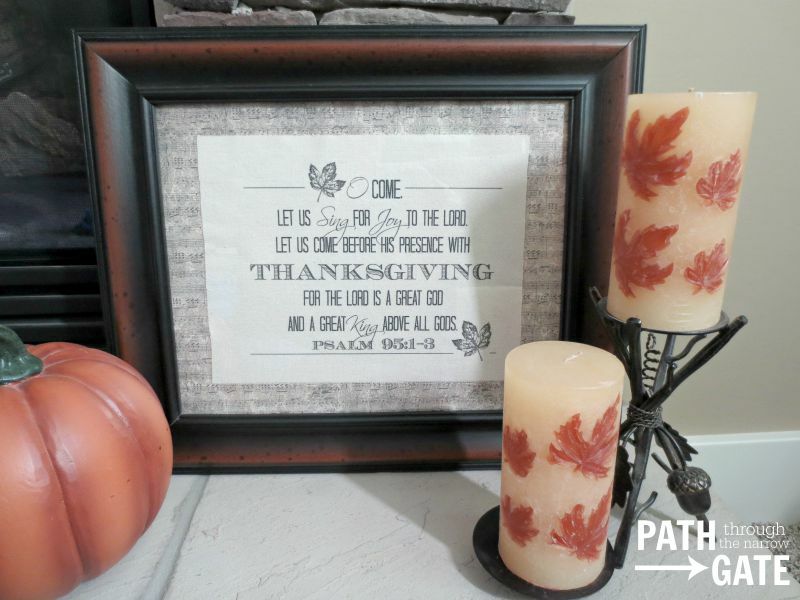 Are you looking for a simple way to add some verses of Thanksgiving to your holiday table? 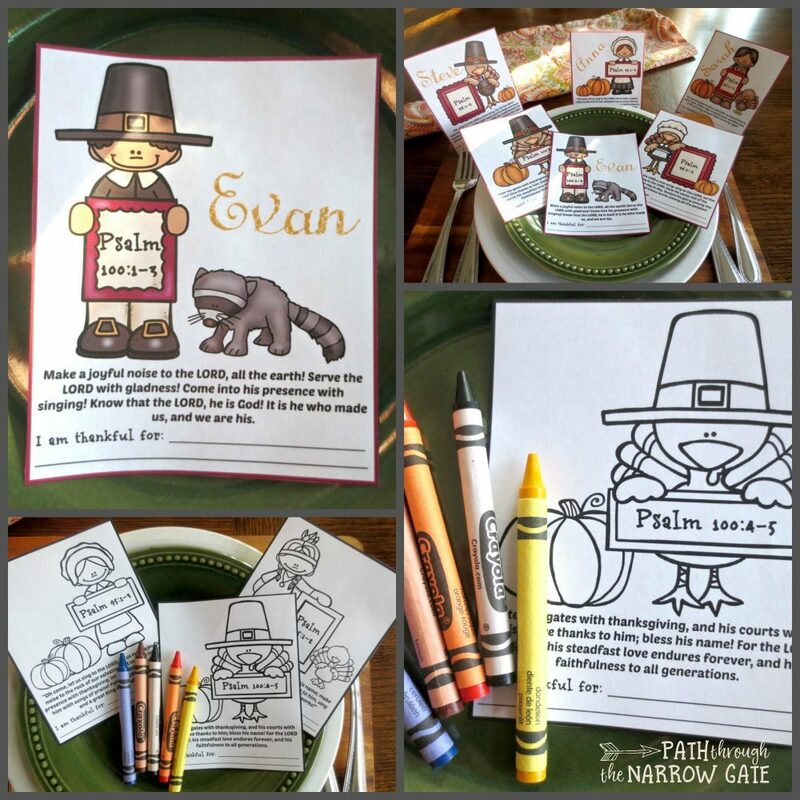 These printable Thanksgiving place holders are just the ticket! This rustic burlap or canvas wall art based on Psalm 95:1-3 is easy to make. Simply print the verse onto the fabric with a laser printer to make this unique wall art, perfect for Thanksgiving or all year! Get Five Finger Puzzles Free! Sign up for the newsletter and get five printable Bible-based finger puzzles absolutely free. Looking for a simple way to share the gospel with your kids? Help your kids get the most out of church with sermon note pages. Do you long to be a faithful prayer warrior for your kids? Do your kids have bad attitudes about work? Copyright 2018 by Path Through the Narrow Gate.